Customers are eager to explore new opportunities as they adopt big data. But the top big data platform vendors have always struggled to advance customers to maturity. Routinely, new customers of big data platforms end up with a common set of questions when they hit a wall somewhere in year 2 or 3: where else can big data be applied? How can new business streams be built with big data? How can enterprise-wide value be extracted out of the investment already made into a big data project? As Tom Redman suggests, distinct opportunities for profit and competitive advantage are typically what customers are eager to explore in their next phase of big data adoption. As a result, advancing customers to maturity has always remained a profound challenge for leaders of top big data platform vendors such as Cloudera, Hortonworks, Microsoft, Google, IBM, Amazon, MapR, Elastic, MongoDB, and Datastax (the Big Ten). Tailoring to the model of the Big Five consulting firms, the Big Ten have built industry solutions teams to evangelize vertical-specific use cases. While they do a good job of driving tactical decisions, there remains an overwhelming gap for customers on the strategic front, such as which businesses to enter. Answers to such queries do not always have a vertical flavor and therefore are often left unexplored. Here’s where strategic partnerships can introduce several more lanes along the path of big data monetization and subsequent uplift in business for the Big Ten. Already a reality in many large companies but a necessity in the future of others, combining data from data consolidators will be key in monetizing data. Before we explore data monetization partnerships, let’s take a leaf from SFDC’s example. As the first cloud platform company delivering enterprise applications in 1999, SFDC executed the partnership model far better than the top five tech giants. Customers looking to expand their use cases to cover additional business processes that weren’t available out-of-the-box. Once partners started building apps to cover a few whitespaces, they realized the power of the customer base already available. Applying this paradigm to address a big data adopter’s incertitude, a company has the opportunity to build new analytics workloads to fulfill the whitespaces now made possible with a data monetization partner. Customers know their business very well and all that is required is a nudge to help them navigate through the information gathering journey. The figure below should serve as a guideline for the Big Ten on how to steer an information exploration journey into a data excavation endeavor. Once the customer has been assisted with identifying the datasets required for a net-new revenue-generating proposal, as a data platform company, the Big Ten can then activate a relevant data monetization partner to help the customer fulfill that new initiative. When it comes to helping customer pilot such gap analysis, picking the right data monetization partner is crucial — and even more so when the customer is looking to build an AI framework to make smart recommendations. A successful partnership, in this scenario, relies heavily on the ability to manage datasets without disrupting customer’s current data model. This is where a unique identifier (UID) becomes key to a successful AI-enhancing data partnership. The figure below shows a vision of a Retail Bank’s datasets surrounded by complementary datasets delivered by a monetization partner feeding a net-new use case. A partner’s ability to organize their datasets by UID helps banks’ AI engines churn out recommendations at the velocity of data. Moreover, customers’ datasets tied to partners’ datasets with UID makes them consumable without the need for cost-prohibitive data transformation IT cycles. This allows the customer to build their net-new use cases as needed and at the speed of market’s evolution. A retail company can leverage partner data in a similar fashion to keep a pulse on market evolution and expose microsegments in order to identify new product lines or brand extensions. As shown in the figure below, companies can ensure the building of a comprehensive marketing strategy by applying partner data to their marketing mix, addressing those 6 Ps. Revisiting the retail bank’s example, it can now imbibe an identical approach by appending location intelligence data to their internal datasets to build machine learning models recommending geo-specific interest rates on their portfolio products — checkings, savings, CDs, money markets, etc. — and maximize their deposits. Likewise, a broadband service provider can apply demographics and census data to identify consumer segments with disposable income and uplift them from copper-based service, for example, to fiber-based services to register incremental revenue. Customers are not the only ones to gain from this strategy. 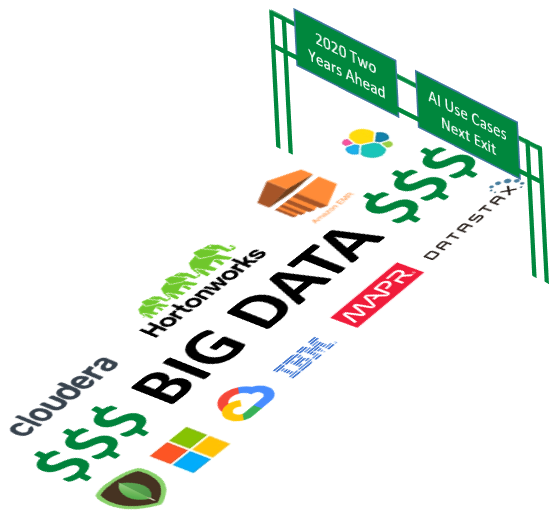 As they begin to build new use cases through data monetization, not only do their number of applications on big data platform increase but also their cluster utilization and sizes, bringing a significant uplift in business for the Big Ten. On an industry average, such partnerships bring anywhere between a 25% to 30% increment in node sizes within just the first year of the alliance. SFDC’s stock ticker performance, shown below, bears witness to the value strategic partnerships can bring to customers and shareholders. From an AI standpoint, it’s important to note that the accuracy and value of a machine learning operation depend on the data it runs on. The precision tends to hit a plateau at some point in time with the available data and to be able to make the AI solution better, external data – be it near real-time or historical data — curated by a third party plays a key role. Some examples may be combining real-time weather data or traffic data in driverless cars or location-based data for advertising. In such cases, partner data combined with already available data will help in optimizing the solution, either in terms of accuracy or monetization or both.